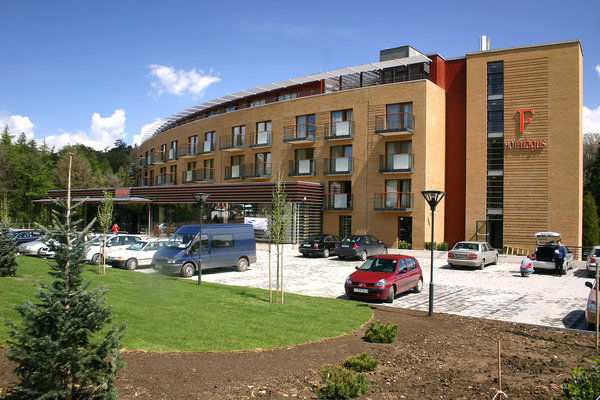 Hotel Fagus**** is a new conference and wellness hotel situated in the forests of Lövér Hills in the green belt of Sopron, just 7 kms far from the border of Hungary and Austria, 15 kms from Lake Fertő, 60 kms from Vienna and 220 kms from Budapest. Our 147 air conditioned rooms and luxury apartments with balconies have been designed to give full comfort fot our guests, at the same time business conferences can be managed comfortably. 128 de luxe rooms, 10 luxury apartments, 2 presidential apartments, 5 family apartments and 2 special rooms for the handicapped are there in the hotel. Every room and apartment is non-smoking, smokers can use the balconies. Equipment of the apartments: twin/double beds, bath tub / shower, balcony/terrace, mini bar, telephone, safe, color TV with satellite and movie channels, alarm clock. In our wellness center we offer opportunities to bath and to relax on 900 square meters: basins for adults and for children, jacuzzies, saunas, hammam, salt cave, fitness-room, squash, cosmetics, massage and vitamin bar. In our restaurants fast business lunches or smart dinners can be managed as well as lunches for groups. Our internationally acknowledged Chef offers an excellent variety of Hungarian and international dishes. Restaurant Borago: for 150 persons, á la carte meals and cold buffet, breakfasts, lunches and dinners, with excellent Hungarian and foreign dishes, terrace for 100 persons. Restaurant Bellis: an exclusive fine-dining restaurant for 50 persons, with flat roof and with beautiful view onto Lövér Hills. Our air conditioned conference rooms equipped with the most up to date technics are ideal scenes for business meetings, conferences or even wedding celebrations with 20 - 60 participants. In our Business Center one can find the widest range of equipment one could need in a conference: computers, scanner, printer, internet connection, photocopier, secretary services, as required. Cars of our guests will are kept in a fully safe, closed camera system protected free parking place or you can choose another perfect protection for your car in a double floor deep garage for 1500 HUF/car/day. • Garage is available for guests at 1500 HUF per car per day. 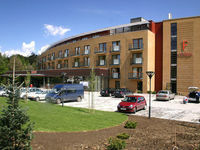 Prices include accomodation, halfboard (breakfast and dinner), the use of the Wellness Center and taxes. City Tax is not included, wich is 1.60 Euro/person/night.